“Six civilians in Israel, including a four-year-old boy, were killed in such attacks during the 50-day conflict,” says the watchdog’s new report, which was published Thursday. More than 4,800 rockets and 1,700 mortars were fired from Gaza toward Israel during the conflict, according to UN data. Only an estimated 224 eventually struck Israeli residential areas, as the rest were intercepted by Israel’s Iron Dome missile defense system. The mortars used by the Palestinian militants are so bad at aiming, Amnesty said, that they sometimes hit Palestinians instead. “In the deadliest incident believed to have been caused by a Palestinian attack, 11 children were among 13 Palestinian civilians killed when a projectile fired from within the Gaza Strip landed in the al-Shati refugee camp,” the report says. Amnesty has stressed that the Palestinians suffered enormous losses during the summer war in Gaza, which resulted in the deaths of 1,585 Palestinian civilians, including more than 530 children. 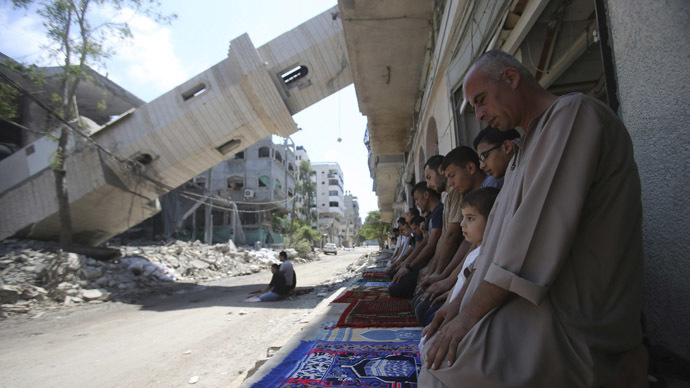 More than 16,000 homes were destroyed in the Israeli strikes. “The devastating impact of Israeli attacks on Palestinian civilians during the conflict is undeniable, but violations by one side in a conflict can never justify violations by their opponents,”said Philip Luther, Director of the Middle East and North Africa Program at Amnesty International. Amnesty International criticized Israeli bombings of Gaza earlier, in its November 2014 report that detailed eight incidents of airstrikes on Palestinian homes, which killed at least 104 civilians, including 62 children. “The Israeli and Palestinian authorities must both cooperate with the probes of the UN Commission of Inquiry and the International Criminal Court to end decades of impunity that have perpetuated a cycle of violations in which civilians on both sides have paid a heavy price,”the new report says. Israel officially declined to cooperate with the UN Human Rights Council committee’s investigation into the country's 50-day 'Operation Protective Edge' in November 2014. It accused committee chairman William Schabas, a Canadian academic living in the UK, of being anti-Israel. In February, Schabas resigned, saying he no longer wanted to be a “target for malicious attacks.” He was replaced by Mary McGowan Davis, a former New York State Supreme Court Justice. The UN report on the war on Gaza was initially due to be made public in March, but Davies asked to postpone it until June, saying investigators needed more time to finish their report on the conflict, as Israel had impeded access to the Gaza Strip and the West Bank.